This article shows how to build a Binary Options strategy and test it in Strategy-Tester of Metatrader 4 with Binary-Options-Strategy-Tester utility. 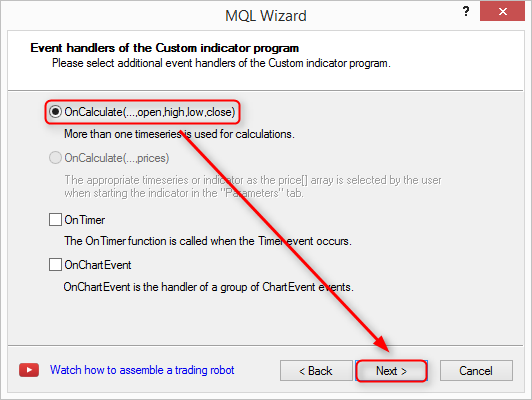 By default Strategy-Tester of Metatrader 4 can test Expert Advisors and Indicators against historical data, but it cannot handle Binary Options with expire times. As I need a possibility to test Binary Options strategies automated in Strategy-Tester of MetaTrader 4, the Binary-Options-Strategy-Tester was build as a utility to fit those needs. This is a step by step example how to build a Binary Options strategy stored in an Indicator (marked as red in image above) to communicate through Binary-Options-Strategy-Library (marked as green in image above) with the Binary-Options-Strategy-Tester (marked as blue in image above), to place virtual orders and count their results with backtests and forward tests. Please keep in mind: Backtesting with historical data will never represent the real future, but it might give you an approximate value to get your strategy more stable. The quality of your backtest will depends on your historical data. Therefore it is strongly recommended to use a set of hight quality data! Test-Framework to test Binary Options strategies in Strategy-Tester of MetaTrader 4. Why a purchased version of Binary-Options-Strategy-Tester utility is needed? A Binary-Options strategy has to call a function of the Binary-Options-Strategy-Tester (via Binary-Options-Strategy-Library) to place the virtual trades. Related to the license concept of MQL4 this only works if the product has a working license. Therefore you have to purchase the product to test Binary Options strategies or this example. The free library will provide several functions to build your Binary Options strategy easily and to communicate with the Binary-Options-Strategy-Tester. See Binary-Options-Strategy-Library for more details of the library. The KVO indicator is used as an example to show the access of external indicators and there ex4 files in section "3.2.6 Use of external Indicators (ex4 files)". See https://www.mql5.com/en/code/8677 for more details of the indicator. Now you can go further with section "3. Binary options strategy example" and build the example code by yourself or just download the code of this example below. Download the code of this Binary Options strategy example to let it run without building it by yourself. To compile the needed .ex4 files open the .mq4 files (KVO.mq4 and BinaryOptionsStrategyExample.mq4 - NOT Binary-Options-Strategy-Library.mqh) in MetaQuotes Language Editor and click on button "Compile" or just restart your MetaTrader 4 after these files are stored in the described folders and MetaTrader 4 will do this automatically for you. The following steps will guide you throgh an example how to build an example Binary Options strategy stored in an Indicator to communicate with Binary-Options-Strategy-Tester. You can build it by yourself or just download the code of the BinaryOptionsStrategyExample.mq4. Please note: This strategy is not a profitable Binary Options strategy! It is just an example how to build a strategy in an indicator to communicate with the Binary-Options-Strategy-Tester utility. Of course you have to build a profitable strategy by yourself. But as you will see, this utility will help you to test and improve your Binary Options strategy. First of all we have to define the strategy and the changable values (input parameters). 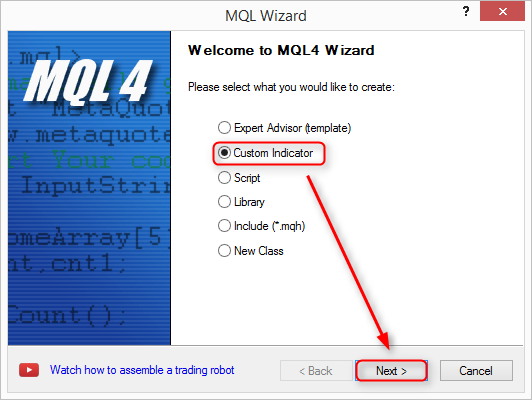 MQL4 documentation shows all technical indicators, which can be adressed over the iCustom interface: https://docs.mql4.com/indicators. Let us say we like to create a simple Moving Average cross strategy with one "fast" and one "slow" Moving Average to trade on next candle after they have crossed each other. Documentation tells, how we can get the value of a single Moving Average: https://docs.mql4.com/indicators/ima. You need to build an indicator which stores your Binary Options strategy to drag it on the chart where Binary-Options-Strategy-Tester is running on. 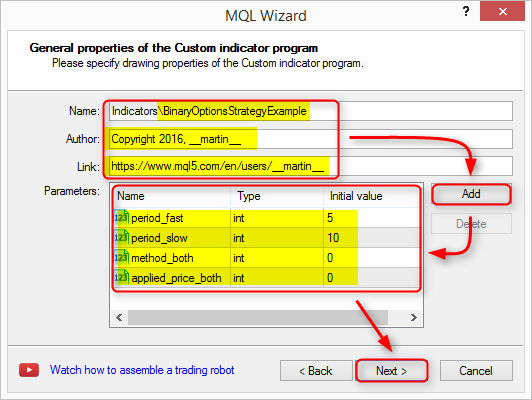 The initial input parameters are created with the MQL Wizard (see 3.2 Create Binary Options strategy) and we will enhance them with the following steps. To avoid to have to enter int-values for applied price and averaging method of the Moving Averages for input parameters, the type for method_both and applied_price_both is changed from int to type of enumeration with a default value. The library will only be available like described in the example above if you placed it in \Include folder of your MetaTrader 4. Changing the content of the library is not needed! CallStrategy()-function in Binary-Options-Strategy-Library will call a function named CheckMyRules() in your indicator where you can place your conditions for your Binary Options strategy. Therefore you have to implement the function CheckMyRules() in your Binary Options strategy indicator. In addition an external indicator which stores its values in buffers can be accessed for the Binary Options strategy, even if only the compiled ex4-file exists. Let us say we like to include the signal line of the KVO indicator https://www.mql5.com/en/code/8677 to place trades only if the signal line is over 0 for BUY trades and under 0 for SELL trades. 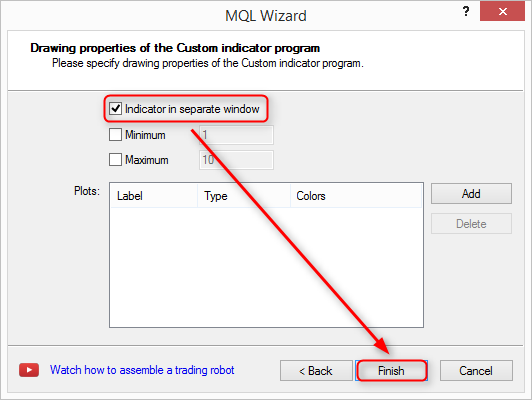 Download the KVO.mq4 indicator and place the compiled (ex4 file) into folder \Indicators\Downloads ([path to your MetaTrader 4]\MQL4\Indicators\Downloads). 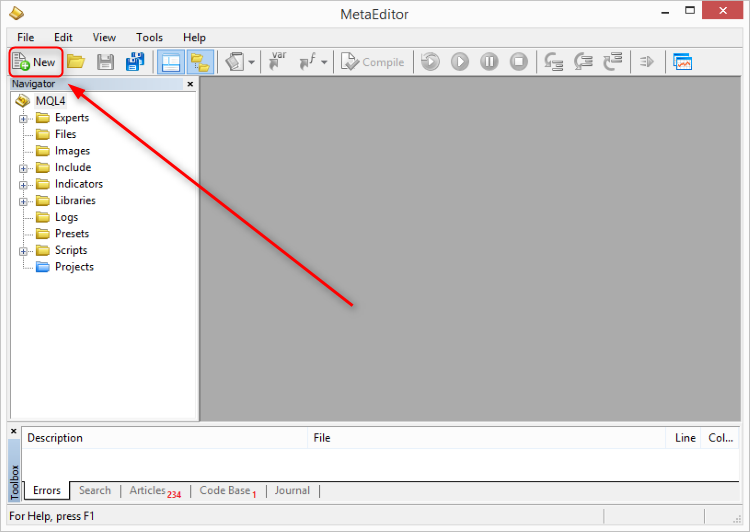 To compile the needed .ex4 file open KVO.mq4 in MetaQuotes Language Editor and click on button "Compile" or just restart your MetaTrader 4 after the file is stored in the described folder and MetaTrader 4 will do this automatically for you. The data window labels tells us the second buffer value of the indicator stores the signal line. If buffers of indicators did not have labels, we can find the right one by comparing the buffer values with the displayed value under the cross in the chart and indicator. Buffers of an indicator starts with 0, so we have buffer value 1 = buffer 0, buffer value 2 = buffer 1 and so on and we have to access buffer 1 to get the signal value. It is also possible to enhance the input parameters of our strategy indicator with the values for the used KVO indicator and set the values in helper function by variables. As this tutorial should be just an example and "as simple as possible", this variant is not shown. Question: Why do you show an example of a non profitable Binary Options strategy? Answere: This is just an example how to build a strategy in an Indicator to communicate with the Binary-Options-Strategy-Tester utility in marketplace to test and improve your strategy. Question: Binary-Options-Strategy-Tester stops after the exact amount of losses with error "Array out of range". Why? Answere: Binary-Options-Strategy-Tester can rise an error after x losses to stop Tester and to analyse the situaion on the chart. If you do not want to, just switch off the option in settings. Question: No arrows appear on chart after I draged my indicator with a working strategy on it. What happened? Answere: You have to enable "Allow external expert imports" on the "common" tab while you drag your strategy-indicator on the chart (log message will show an error in this case). Question: No arrows appear on chart after I draged my indicator with a working strategy on it with "Allow external expert imports" enabled. Why? Answere: A strategy has to call a function of Binary-Options-Strategy-Tester to place virtual trades. Related to the MQL4 license concept this only works if the product has a working license. Therefore you have to purchase the product. Question: No arrows appear on chart after I dragged my indicator with a working strategy on it and I got errors like "Cannot call .." or "Cannot load .." in the log of MetaTrader 4. What can I do? Answere: Use the latest version (greater v1.00) of BinaryOptionsStrategyLibrary.mqh. Check version tag in code of your BinaryOptionsStrategyLibrary.mqh and see changelog v1.01 of BinaryOptionsStrategyLibrary. Question: I see no results on Strategy-Tester tabs "Results", "Graph", "Report". Where I can see the results? Answere: Strategy-Tester of MetaTrader 4 can not handle Binary Options so these tabs con not be used. Therefore this utility calculates all wins and losses and prints the results on the chart. As I need a possibility to test Binary Options strategies automated in Strategy-Tester of MetaTrader 4 for long time periods in a short time and to do foward tests on the chart of the broker, this utility was build. I have spent a lot of time for the concept and the implementation of the Binary-Options-Strategy-Tester as well as for the documentation. Maybe there is a better way to do it and maybe some improvements will bring it closer to fit the needs of you. So please feel free to contact me for ideas for improvements! Is there a way you know one could test a binary option strategy in mql5? unfortunately I do not know a way to test a binary options strategy in mql5. Coudl you advise on this ? Please note that using standard EA and the same iCustom call I can get data for all periods. Which indicator did you use? Is there a free version of the indicator? I will contact you via PM. Thank you for this great software to test binary strategy's. I use for my strategy an ex4 file because it was already developed and there is mo mq4 file. This indicator generate only an up and down arrow. There are only 2 indexbuffers one for buy (indexbuffer 0) and one for sell (indexbuffer 1) these are in the color tab from the indicator. Is it possible when one arrow appears that your tester wait for a the start of a new 60 sec candle and then analyse the result from that trade? I use your latest indicator. I attached the file also. Is it possible to send the indicator on an different way to you? Hope that you can help me further with it. Hi there Martin, please advise if you charge to create an EA based on my specified indicators and rules for trading as I need to create a binary options EA to use on MT4. Thanks. if you can help me and put the functions in it for me to observe the correct way of doing, I sent the file mq4 via mp. The article describes how currency pairs can be divided into groups (baskets), as well as how to obtain data about their status (for example, overbought and oversold) using certain indicators and how to apply this data in trading. The article reveals the portfolio trading principles and their application to Forex market. A few simple mathematical portfolio arrangement models are considered. The article contains examples of practical implementation of the portfolio trading in MetaTrader 4: portfolio indicator and Expert Advisor for semi-automated trading. The elements of trading strategies, as well as their advantages and pitfalls are described. Over the ten years since the release of the first version of the ZUP platform, it has undergone through multiple changes and improvements. 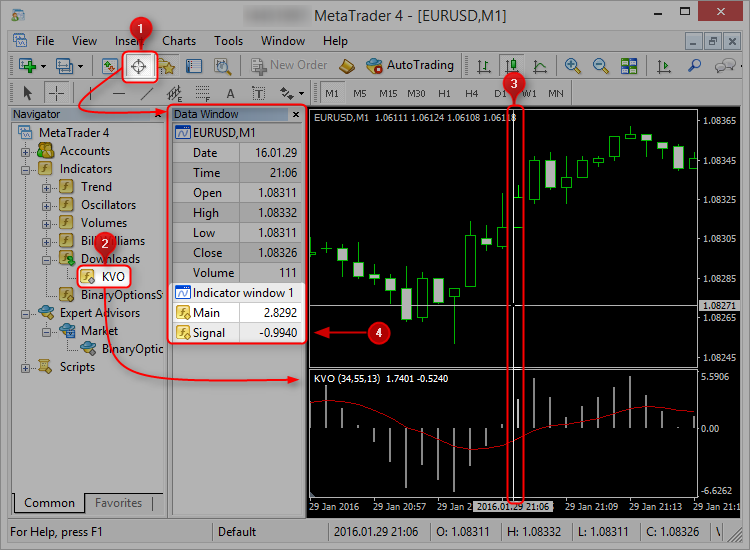 As a result, now we have a unique graphical add-on for MetaTrader 4 allowing you to quickly and conveniently analyze market data. The article describes how to work with the graphical interface of the ZUP indicator platform. In this article, we discuss the method of trading analysis by measuring angles in the MetaTrader 4 terminal. The article provides a general plan of using angles for trend movement analysis, as well as non-standard ways to the practical application of angle analysis in trading. The article also provides conclusions that can be useful for trading.